Chicago has the Stanley Cup, now what? What are Chicago fans going to do with hockey done? Chicago fans will have a tough summer with hockey done. Now that the hockey season is over, the Blackhawks have to deal with their free agents and the draft. The team traded Dave Bolland to the Toronto Maple Leafs for three draft picks. They also sent Michael Frolik to the Winnipeg Jets for addition draft selections. These moves allowed the team to re-sign Bryan Bickell to a four year deal. The salary cap forced changes again with the roster, but not ones as difficult as the 2010 changes. Still, it is hard for the fans to see Bolland, known as "the Rat," leave after scoring the winning goal for the title. Frolik had a big role with the team&apos;s penalty kill unit. Restricted free agent Nick Leddy said he also wants to remain a Hawk. General Manager Stan Bowman said he is more than likely to match any offer. The one free agent who seems to be leaving is Viktor Stalberg. The Swedish winger showed emotion when I asked him about his situation. He thought his lack of playing time put him in a difficult spot. “It was one of the toughest things to go through,” he said. He also said he doesn’t want to play the same role again. Expect him to play somewhere else. It is almost gratifying to realize the hockey has overshadowed a very bad baseball season. Both teams have languished in the bottom of their divisions. 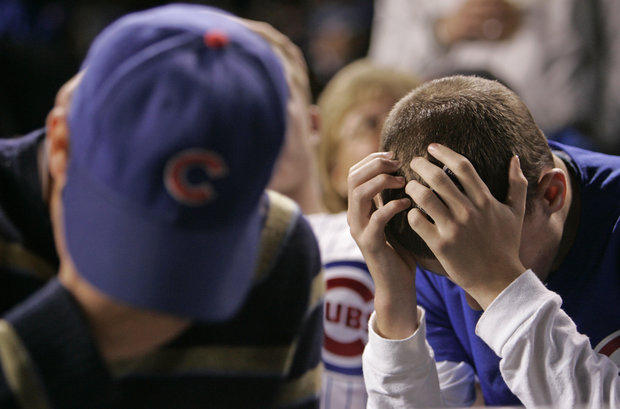 The Cubs continue their rebuilding effort and the Sox are a very flat team. It appears the most interesting news for the Cubs and White Sox is who will get traded at the deadline the end of next month. With scouts lining up to watch Matt Garza pitch yesterday, he is a strong candidate for another team. The right hander’s health is the biggest concern for a trading partner. Scott Feldman has pitched well enough to get a look by teams. The Cubs best hurler has been Travis Wood. He should be a keeper at this point. The White Sox have to figure out if it is time to wave the “white flag” on a team that has underperformed and has looked bad on offense and horrible on defense. There are not many commodities to make deals. Jake Peavy is still nursing a broken rib. The Sox pitcher is expected to return after the All-Star break. Another player that may draw interest is Alex Rios. The Sox outfielder has been the most consistent hitter on the club. The best player that will be made available is Jesse Crain. So the most exciting day for baseball may be July 31: the trading deadline. Bears fans can circle July 26 for a chance to see the team in action for the first time since Marc Trestman took over as head coach. That first practice in Bourbonnais will not be with pads. Those workouts start July 28. After attending the Bears OTA’s and mini-camps, fans will have plenty to watch. On Thursday night the Chicago Bulls took a guard/small forward Tony Snell from New Mexico in the first round of the NBA draft. He is considered a good shooter and is best in the “catch and shoot” role. Defense is also considered an asset. When you take the 20th selection, who knows. The team did do well with Jimmy Butler and Taj Gibson in the range of the first round. The took Erik Murphy a 6&apos;10" forward from University of Florida in the second round. The WNBA&apos;s Chicago Sky hopes to make the playoffs this year. They may have some of the pieces in place. Rookie Elena Delle Donne with veterans Sylvia Fowles and Epiphanny Prince have a winning record at 7-3 and a post-season appearance would help this franchise get legitimate interest. The Chicago Fire has rebounded from a slow start this season. The MLS soccer team is 5-1-2 since their last loss on May 18. Right now the Fire is 5-7-3 overall.